I'm hearing that a $149billion "jobs bill" has just passed a procedural hurdle in the Senate. Of the $787 stimulus bill - I wouldn't want to confuse that with a jobs bill - $499billion remains to be awarded. I say awarded instead of spent, because even after being awarded much of this money is just lying around. 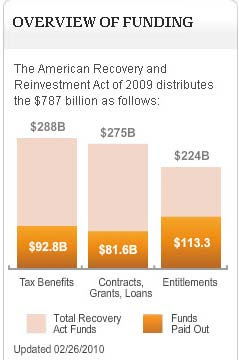 Even in the most direct job-creating piece of the stimulus (Contracts, Grants and Loans), $193billion of the $275billion total has not even been awarded yet. These people simply do not care.